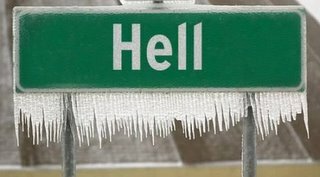 The weekend Hell... er, Wisconsin, froze over. I haven't had to turn the heat on in my apartment once this winter. Not once. And for Wisconsin, in February, that's pretty good. While the rest of the free world is forfeiting car payments and groceries to pay their electric bill, I get a $35 bill in the mail month after month. And even that gets split between The Roommate and I. But suddenly Hell has frozen over. Literally. It's so cold here, I wouldn't doubt if it's frigidness reached the bottomless pits of Hell. And I'm still too stubborn to turn the heat on. Friday night there was a wind chill warning. Not an "advisory." A warning. As in "Warning: Hell is about to freeze over. Grab your children. Run for the hills (or Hawaii). Whichever is warmer." The wind chill got to 35 degrees below zero Friday night. THIRTY-FIVE BELOW ZERO. That is ludicrous. I went outside and my blood froze. Saturday wasn't any better. Cars weren't starting. People hid indoors. Babies were crying. You know, the usual chaos. I talked to a meteorologist on Friday who promised me a "heat wave" on Sunday. So I woke up, put on my sunglasses, grabbed my bikini... and oh, wait. By heat wave he meant 15 degrees. Crap. So I hid indoors Sunday. In sweatpants. A fleece. Thermal socks. Under three blankets. Needless to say, it's starting to get a bit chilly in the apartment. But I rationalize this by telling myself, "You know, Krista, it's late February. Spring is in less than 30 days. Stick it out. Be a man. You don't need the heat on." So that's what I'm going to do: stick it out. Seriously. Why pay $210 a month to be warm, when I can pay $17.50 and dress in layers? I'll just go home tonight, put on something warm, light some candles and watch TV. Of course, the candles are for warmth. Obviously.